Jewelry Days.com Official Blog: 60 Minutes' story on gold! 60 Minutes' story on gold! Mr. Pelley missed the real story on conflict gold and instead gave us milk! Every Sunday I meet with Scott Pelley and the other staff members of the long running CBS news show, 60 Minutes, to review the investigations that the crew has been doing over the past few months. Of course I am one of millions of others who also attend these meetings via our local CBS stations, but for the decades of faithful attendance at these weekly reports I feel as if I am a part of this news team as I am sure other long time viewers do also. 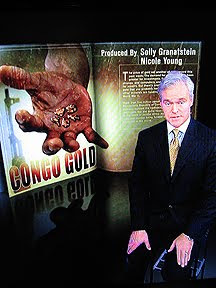 Last Sunday, however, I was disappointed at Scott Pelley’s report on the gold mines of the People’s Republic of the Congo . The main reason is that Scott went all the way to Africa to learn about the mining processes, but he failed to go a few hundred miles to small town America to learn about the impact his report would have on small town, independent retail jewelers. Mr. Pelley did what virtually all of the major network news shows do these days when it comes to jewelry related news stories, he got lazy. He went for the sensationalistic gonzo journalism and failed in the hard hitting 60 Minutes type reporting that those of us of the Vietnam era days remember. If Mr. Pelley wanted to get to the real nadir of the problem he would have reported on the supply chain of AK-47 ammunition and RPG launchers to the Congolese thugs he just briefly discussed in his story. He failed to present the fact that it is the lack of marketing and distribution control of AK-47 ammo and RPG rounds that is the real problem in the Congo gold fields. That is where a true distribution control is needed….not with home town, independent jewelers regarding gold. The timing of this story on the first weekend of the Holiday Season is regrettable. The lack of journalistic acumen by Mr. Pelley is even more regrettable. I wish not agree on it. I assume warm-hearted post. Specially the title attracted me to study the unscathed story. Your blog are very nice. particularly the title pulled me to study the unscathed story.